In this 3-part blog series, we are addressing common pole conditions that halt service deployment and can be costly to asset owners. It is our experience that asset owners often do not know the current statue or condition of all assets in the field. For our first article, we will be looking at dangerous conditions surrounding utility poles. Utility line workers face danger at their jobs every day. In fact, installers and repairers of utility poles are ranked one of the top ten most dangerous jobs in the country. There are several factors surrounding utility poles that keep the job ranked so high on the list. Utility poles carry high voltage and should be always be approached with caution. While asset owners’ number one concern is field safety, many do not realize the dangerous risks unchecked poles may pose. Uninspected utility poles cause hazardous threats to the public when joint use management teams are unaware of their condition. Watch the video below to learn more about dangerous pole conditions. Our experience with auditing poles has shown us dangerous conditions face-to-face. The dangers of utility poles are often violations that should be taken care of by asset owners. Here are three concerning, yet common, dangers. 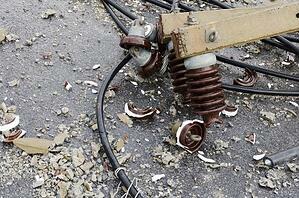 Electrical hazards begin with the high voltage of cables that the poles hold. The electrical contact of wires is responsible for about 411 deaths per year on job sites. Overhead wire hazards may include too many wires, storm damage, and overloading on a pole. Excessively tight lines can be threatening to line workers. Lines should be positioned on poles in a specific order, and there should always be a neutral space between lines to ensure worker safety. Climbing obstructions are dangerous and can be a consequence of many issues, including rotting wood, cracks, and holes. Line workers and field technicians must be overly prepared to climb a pole with necessary gear, and these obstructions make things much more risky. From storms to fallen trees, the environment plays a significant part in the dangerous conditions that are sometimes on poles. Unkempt vegetation may have grown on the pole or may block linemen from inventory and maintenance. Insects may have infested the pole. Stay tuned for the third blog in this series about how environmental conditions can accrue violations and effect pole safety. Dangerous conditions add up. Without regular inspections, they remain out-of-sight to the responsible party. The consequences of delaying a pole inspection can be long-term and destructive to asset owners and their organizations. The only way to know what’s going on in or on your poles is through a thorough inspection of dangers on the pole by professionally-trained and experienced teams. Comment below and share your thoughts on pole safety.